Mrs. Leslie Ruth Brooks Martin was born in Alexander City, AL to the late Mr. Leslie Brooks Jr., and Mrs. Mary Gamble Brooks. Leslie graduated in 1968 from Laurel High School, and shortly after married her high school sweetheart/husband of 48 years. Leslie moved to Canada while her husband pursued his career, but later returned to Alexander City. Leslie served faithfully as a devoted wife, textile worker, and mother to her two daughters, and an outstanding grandmother to her grandson. Leslie accomplished many things while here on earth, but her biggest, and greatest accomplishment was being a living witness for Jesus, and remaining a steadfast, and obedient child of God. She was a member of Great Bethel Baptist Church. Leslie was preceded in death by her sisters Annie Lee Brooks, Rosie Lee Russell and her three brothers Charles Brooks, Tommy Lee Brooks, and Robert Henry Russell. 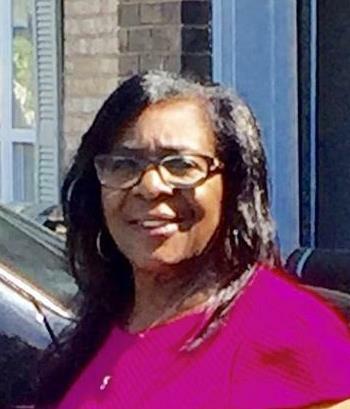 Leslie departed this life on Friday June, 15, 2018 at DCH Regional Medical Center, Tuscaloosa, AL. The heartfelt memories, love, kind gestures, stern advice, motivation, direction, and loving spirit will live on forever through her caring family. Leslie leaves behind her husband Willie Carl Martin of Tuscaloosa, AL. Two daughters, Carla(Marlon)Farquharson of Decatur, Ga, and Kizzy(Doyle)Metcalf, Sr. of Ellenwood, Ga, and her grandson Malik Martin of Tuscaloosa, AL. Her mother, Mary Brooks of Alexander City, AL, her mother-in-law Josie Bernard of Elberton, Ga. Her sisters, and Brother Henry Mae Wilson, Mary Lee Owens, and Freddie Brooks, Sr. all of Alexander City, AL. There are also a host of aunts, uncles, nieces, nephews, close family, and friends that will cherish her memories forever.